Because of Tai Chi's emphasis on correct form and feeling each movement, it is practiced very slowly and gently. 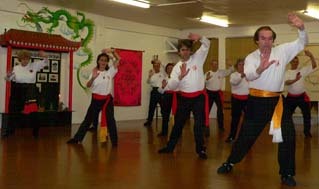 Completely non-impact, yet involving the entire body, Tai Chi promotes, strength of practitioners. Because the whole body moves as one, Tai Chi cultivates the link between mind and body, enhancing balance and coordination. Practitioners develop confidence and ease of movement. Each form has a definite martial application which are not always obvious to the casual observer because of the gracious circular and spiral movements which look more like a dance. The main focus today is on the proven health, fitness and stress relief value of Tai Chi. The movements (or forms) are practiced at a slow and gentle pace. These are not merely physical exercises, but are also mind exercises. In research projects held at Emery and Ohio Universities various forms of exercises were tested. It was found that Tai Chi was by far the best exercise to enhance coordination between mind and body. Tai Chi benefits people and of all ages - (research has proved that if the elderly practice Tai Chi regularly, there is a marked decrease in falls because it enhances their sense of balance). Tai Chi is particularly good for the prevention and improvement of arthritis. Regular practice of Tai Chi can bring a wide range of health benefits to the muscular, skeletal and circulatory systems. The flowing movements of Tai Chi serve as a moving meditation that reduces stress and provides a way to cultivate body and mind. Toning of muscles, tendons and other soft tissues. Rotation of the joints through a full range of motion. Stretching and alignment of the spine to make it strong and supple. Gentle massage of the internal organs to improve their functioning. Exercise is an essential part of health. The aim of exercise is to improve flexibility, muscular strength and fitness. Improves the flow of Qi (a life energy necessary for health and vitality). Can be practiced anywhere and by everybody regardless of age. Tai Chi strengthens the body as well as the mind from within.